Carlton Hill, early photo. 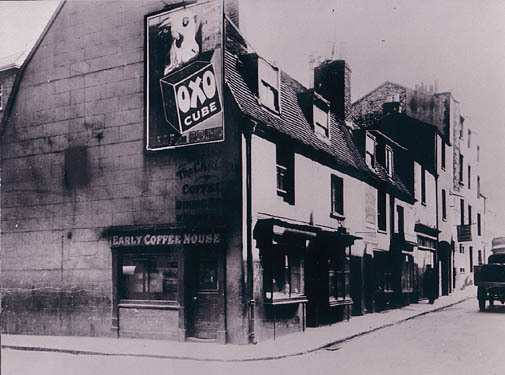 Early Coffee House with Oxo poster. My great-grandfather James Robert Dudley North Scroggins, was the owner of this coffee shop at 22 Carlton Hill in 1881. I know this because my grandfather George James Scroggins was born in the rooms above on the 5th of July 1881, where the family lived, and the above information is on his birth certificate. I would appreciate any information you can give me on the wording above the door. I can make out some but not all of the wording as the photo file is so small, or if you could send me a larger photo. Regarding the comments by Brian Cross about this photograph, Paul Jordan has sent me the same photo. Is this in fact The Carlton Arms of which my great grandfther William Burchett was once the proprietor? If so, it should be No 1 Carlton Hill. I would like to know please. My grandfather James Lower a tailor was living at 18 Carlton Hill in 1881, at the house of a newsagent and confectioner, his nephew Alfred Hedger. Do any more photographs of this street exist? One of my ancestors, Thomasina Barnard (nee Mugridge), was the wife of a publican who lived at 92 Carlton Hill for many decades. I believe the place was called the Carlton Tavern. Any more info on this would be much appreciated. Thank you. Has anyone got an old photo of 64A Carlton Hill (on corner of Blaker Street) – when it was the former post office? I would be interested to see this. Very interested in photograph of Carlton Hill, as my GG grandfather Joseph Boulter lived at 37 Carlton Hill at the time of his marriage in 1862. His occupation was Chimney Sweep. Oh how I love this website! So lovely to see this picture of Carlton Hill. My second cousin 2x removed Harriett Nutley married Frank Gillam in 1904 and by the 1911 census she was living with him and four children at 3 Carlton Hill. If anyone has any information regarding this family, please contact me at stephenntly@hotmail.com. This is the first time I have come back to this site since posting my comment. In answer to your question Steve Burchett – you are right it is No 1 Carlton Hill. My great grandfather was the proprietor of the coffee house in 1880 until about 188? as the next child recorded was born in Funtington Sussex in 1888. When was your great grandfather the proprietor of the The Carlton Arms? Steve, this is the first time I have visited this site for family research and I was delighted to see my Great Grandfather’s name appear – William Burchett b.1849. The Sussex Post Office directory lists him as a Beer Retailer living at 1 Carlton Terrace from 1874-1878. Hallo Brian Cross. Did you ever find out what was written above the door? If not, here it is: The Carlton Coffee Dining Rooms W.Brakes. I found it on the James Grey Collection. In reply to Brian and Jane my great grandfather William Gains Burchett was at the Carlton Arms from at least 1871 from census records. He was still there in 1901 but from street directories gone by 1903 when the premises changed use I believe. It may be then that the premises was a coffee shop at one end and also a beer house at the same time. Naomi, my 2nd great grandfather was also Thomas Herbert North Scroggins and I have traced this family back to Suffolk. Another of my 2nd great grand parents were James and Emma Stevens who were the publicians for the Star pub at 95 Carlton Hill from 1878. Naomi Scroggins and Brian Cross, you might find this link helpful as you can trace the family tree back or forward.